When building or upgrading a gaming PC, one of the most looked over components is a high-quality keyboard. Unfortunately, many gamers believe that all keyboards are equal, which couldn’t be further from the truth. The best gaming keyboards offer a multitude of improvements over standard keyboards, such as built-in media keys, a backlight and proprietary technology to give you an edge when you game, especially in online multiplayer matches. If you take a look at the equipment used in any professional eSports tournament, you’ll notice that every gamer there uses some variation of a gaming keyboard, which is a testament to how well these keyboards perform. Before you take the plunge and purchase a gaming keyboard, you need to know what separates the best gaming keyboards from the worst. What Makes a Good Gaming Keyboard? Unlike other hardware components, such as a graphics card or a CPU, there aren’t a lot of factors involved in what makes an excellent gaming keyboard. However, this doesn’t mean you should just run off and purchase the first gaming keyboard that strikes your fancy, as you could pay for features you never intend to use! The first thing to think about how you plan to use your gaming keyboard and under what conditions. For example, if you’re going to use it primarily during the day, a powerful backlight is likely not that important. Likewise, if you don’t plan on playing a lot of MOBA or MMORPGs, you may not have a use for programmable keys. By figuring out the primary use of your gaming keyboard, you can zero in on the features that are important to you and pick the perfect gaming keyboard for your needs. In the following sections, we’ll cover each of these categories more in-depth, plus discuss a few other things you need to keep in mind when purchasing a gaming keyboard. One of the first things consumers notice about a gaming keyboard is that it packs a lot of additional buttons onto its frame. In addition to your standard keys, a gaming keyboard typically has extra multimedia buttons, programmable keys and perhaps even a volume knob. Multimedia keys are standard on every gaming keyboard, and it’s rare to find a keyboard that does not include any of these keys. The difference between budget and high-end gaming keyboards are the number of multimedia keys on the keyboard. For example, a budget gaming keyboard may only have buttons to lower, raise or mute the volume while a high-end keyboard may include buttons to launch apps and control a media player along with a dedicated knob to control volume instead of buttons. If you’re trying to save a bit of cash, none of these extra multimedia buttons are essential, mostly just adding convenience for the user. If you feel like you can live without a volume knob or dedicated buttons to open apps, it’s worth it to save a few bucks and get a cheaper gaming keyboard. The other set of additional keys on a gaming keyboard are a set of programmable keys, allowing users to map complex commands that they can activate with the press of a single button. While MMORPG and MOBA gamers will love these programmable keys, if you’re looking to play RPG or FPS games, you’re likely not going to have a use for them. When making the decision over how many programmable keys you need, if you need them at all, think about the type of genre you play the most and go from there. 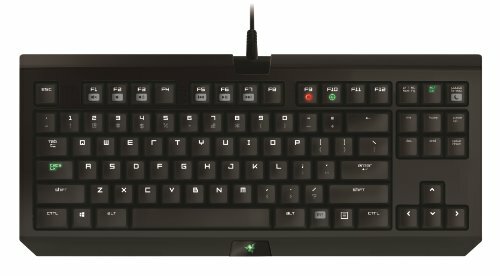 One of the hardest categories for gamers to figure out when looking at a gaming keyboard is whether to purchase a wired keyboard or a wireless one. Each one has their distinct advantages and disadvantages, and ultimately, the decision rests in whether you value responsiveness or convenience. A wireless keyboard is ideal for those who want the freedom to put their gaming keyboard wherever they want, whether it’s next to the monitor or on their lap. 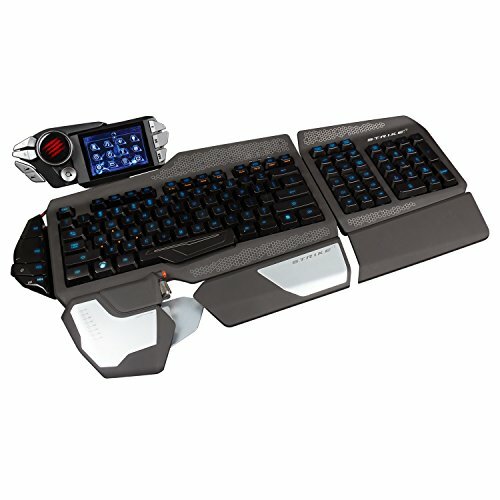 Most gaming keyboards typically have short cables, so a wireless keyboard is ideal for those whose computer case isn’t near where they want to use their keyboard. 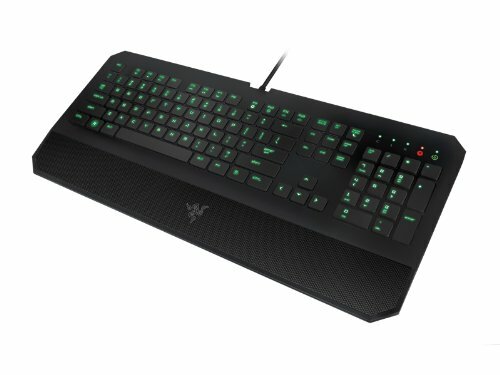 Also, you also won’t have to worry about unsightly cables draped across your gaming area with a wireless keyboard. However, with a wireless gaming keyboard comes a slightly slower response time, which isn’t going to fly for most professional gamers. Sometimes, all it takes is that extra millisecond delay for your action to register to turn a victory into a defeat. Not to mention, you’ll save money in the long run with a wired keyboard as you won’t need to buy batteries every time your keyboard needs a recharge, nor will your keyboard cut out during an intense match due to lack of power. In the end, the decision over whether to go for wired over wireless or vice versa is purely a personal choice. If you’re someone who takes gaming seriously and value that extra responsiveness, opt for a wired keyboard; on the other hand, if you’re a gamer who values convenience over above all else and don’t mind always buying batteries, a wireless gaming keyboard is the best choice. If you’re planning on pulling frequent all-night sessions with your favorite PC games, an ergonomic design for your gaming keyboard is of the utmost important if you want to avoid wrist and hand injuries. Luckily, the majority of gaming keyboards take your health into account with standard features such as a wrist rest and raised keys. Some gaming keyboards even offer adjustable height and tilt controls, letting you place your gaming keyboard in a position that works best for your wrists. 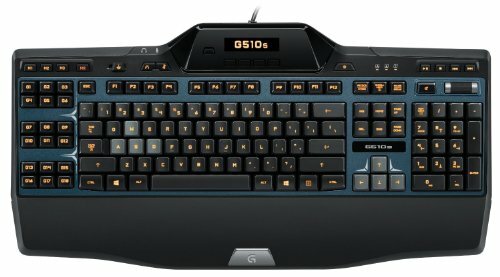 If you’re going to spend long hours at your computer playing games, look for a gaming keyboard that has as many of these ergonomic features as possible; your wrists will thank you later! PC games these days are far more complicated than they were in the past, with almost every button on your keyboard used in some form. In fact, some games, such as first-person shooters like Counter-Strike: Global Offensive, routinely have you pressing two or more keys simultaneously to pull off advanced moves. Anti-ghosting technology is the technology that allows you to press more than one key and have your keyboard register each key press, which isn’t possible on standard or older keyboards. While you’ll find anti-ghosting technology on every gaming keyboard in some form, what differs from keyboard to keyboard is the amount of keys that you can press simultaneously. Some of the low-end gaming keyboards only allow you to press four or five keys simultaneously while some high-end keyboards up this number to a whopping 19 keys. If you’re planning on playing games that require fast reflexes and multiple key presses, it’s worth it to get a keyboard that supports as many simultaneous key presses as possible. If you plan on playing games that don’t require a lot of simultaneous key presses, such as role-playing games or strategy games, save yourself some cash and opt for a budget gaming keyboard. 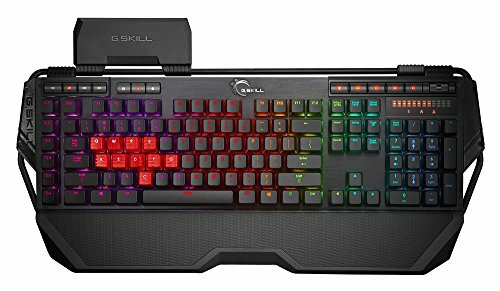 Should I Buy a Mechanical Gaming Keyboard? Once thought of as a niche product, mechanical keyboards are making a return in a big way, with many professional eSports players pledging loyalty to this category of keyboards. It’s easy to see why, as mechanical gaming keyboards offer more precise control over your key presses, less accidental key presses and the ability to double-tap keys quicker. With games such as League of Legends, where precise, rapid key presses are necessary for victory, a mechanical keyboard makes a fantastic gaming keyboard. The one thing you’ll want to look for when buying a mechanical gaming keyboard is the type of switch used. In a mechanical keyboard, each key has an individual mechanical switch under it, with certain kinds of switches being better for gaming than others. The best mechanical switches for gaming are Cherry MX Red, Black and Brown, in that order, and you’ll want to avoid Cherry MX Blue mechanical switches, as these switches benefit typists more than gamers. Some budget mechanical gaming keyboards use proprietary mechanical switches and, while these switches are decent in their own right, you’ll want to stick to the Cherry MX brand whenever possible if you want the highest quality mechanical gaming keyboard. While the mechanical switches themselves provide a noticeable difference over an electronic membrane keyboard, the other advantage a mechanical gaming keyboard has is its weight. Due to the mechanical switches, a mechanical gaming keyboard is much heavier and less prone to moving around your desk. A mechanical gaming keyboard may sound like the perfect gaming keyboard, but it does offer a few disadvantages that gamers should take note of before purchasing. Mechanical gaming keyboards are notorious for the loud noises they make while typing, with each key making a loud and distinctive “clack” sound as you press it. While some mechanical gaming keyboards boast quieter key presses, overall a mechanical keyboard is a noisy device that could potentially annoy your roommates or neighbors. Also, some gamers may not enjoy the feel of a mechanical keyboard or the increased amount of pressure it takes to press a key. If possible, try out a mechanical keyboard at your local electronics store before purchasing one, envisioning if the keyboard is something you think you’ll still enjoy after a few hours of continuous use. Do I Need All These Backlights? While even most standard keyboards these days come with a backlight, some gaming keyboards boast a whole spectrum of backlights for gamers to enjoy. While most gaming keyboards offer a minimum of three different colors of backlights, others possess an unlimited color spectrum that allows users to customize the backlight into any color they desire. Outside of looks, there is no real difference in backlight color; for example, a red backlight can illuminate a keyboard just as well as a purple light. If you’re not that concerned about personalization or even what color your keyboard displays, then opt for a gaming keyboard that just offers a few standard backlights. If you’re planning on frequently playing games at night, you may want to consider a gaming keyboard that provides a backlight with adjustable brightness levels. Why Do Some Gaming Keyboards Have an LCD Screen? On some of most expensive gaming keyboards, you’ll notice a peculiar LCD screen at the top of the keyboard, which varies in size depending on the manufacturer. This LCD screen acts as a secondary screen for your games, displaying information such as your health, ammo count, and other game-specific information. Also, on some keyboards this screen also acts as a media center display, displaying information such as the currently selected song and artist for your music tracks. While this information is convenient, it’s hardly necessary, and in many cases not worth the extravagant fees associated with placing a second screen on your keyboard. The LCD screen is a feature you can safely skip unless you have additional disposable income burning a hole in your pocket and are looking for a feature to make your keyboard stand out from the pack. The decision to get a gaming keyboard that offers USB ports built into is, like most extras on a gaming keyboard, a personal one. If you’re planning on using a pair of wired headphones, being able to plug them directly into your keyboard is more appealing than plugging them into the back of your computer or even your speakers. This same convenience also applies to wired gaming controllers, with many gamers preferring just to plug these devices directly into their keyboard rather than fumbling with their PC case looking for a spare USB port. Ultimately, we recommend that if possible, try to choose a gaming keyboard that offers USB ports, as the convenience factor far outweighs the slight increase in price. Now that you know what to look for in a gaming keyboard, you’re ready to select one of your very own. Below, we’ve gathered the top 12 best gaming keyboards in three different categories: budget, mid-range, and high-end gaming keyboards. From mechanical to electronic with a range of additional keys to hardly any at all, there’s something for everyone on this definitive list of gaming keyboards. The HAVIT Rainbow Backlit Wired Gaming Keyboard is a gaming keyboard that combines style and substance into one package. This gaming keyboard features the ability to swap the W, A, S and D keys with the arrow keys along with the option to disable the Windows key. The anti-ghosting technology supports the simultaneous pressing of 19 keys while the 12 multimedia keys let you control everything from your volume to your media player. The starring feature of the HAVIT Rainbow Backlit Wired Gaming Keyboard is the seven different LED backlights, with each backlight featuring three different brightness modes. The HAVIT Rainbow Backlit Wired Gaming Keyboard is compatible with a broad range of operating systems ranging from Windows 2000 all the way to Windows 10. The SAREPO Mechanical Gaming Keyboard features proprietary blue mechanical switches, and while these switches aren’t ideal for gaming, this is still a great starter mechanical gaming keyboard. At such a low price, this keyboard is a great way to test out a mechanical keyboard without having to spend a lot of money upfront. This keyboard is durable, lasting for at least 50-million clicks before you’ll need to think about a replacement. With nine different LED backlights, the SAREPO Mechanical Gaming Keyboard gives you plenty of options when it comes to customization. The anti-ghosting capability of the SAREPO Mechanical Gaming Keyboard only supports up to a maximum of six keys, so while this keyboard isn’t ideal for games like League of Legends, it will work just fine for the turn-based strategy and puzzle genres. 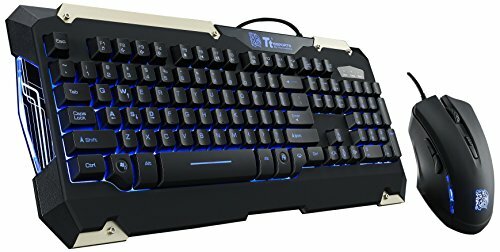 If you’re looking for a gaming keyboard built for eSports, then look no further than the Tt eSports COMMANDER LED Illumination Gaming Keyboard. 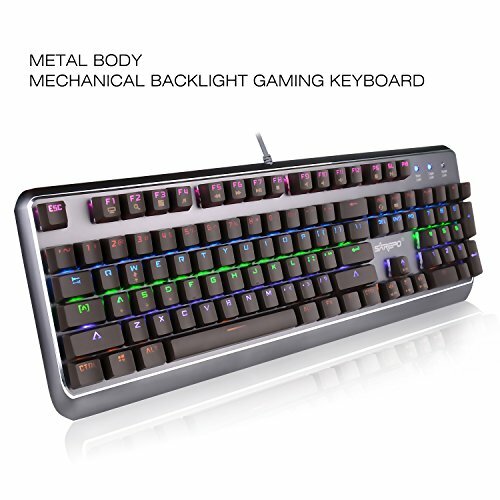 This budget gaming keyboard includes features typically reserved for keyboards more than twice its price, including durable metal edges, mechanical key caps, auto-repeating keys and a powerful LED backlight. The best part about the Tt eSports COMMANDER LED Illumination Gaming Keyboard is that not only do you get a great budget gaming keyboard with your purchase, the manufacturer also throws in a high-quality gaming mouse for free! If you’re looking for a good mid-range gaming keyboard, look no further then the SteelSeries 64470 Apex 350 Gaming Keyboard. 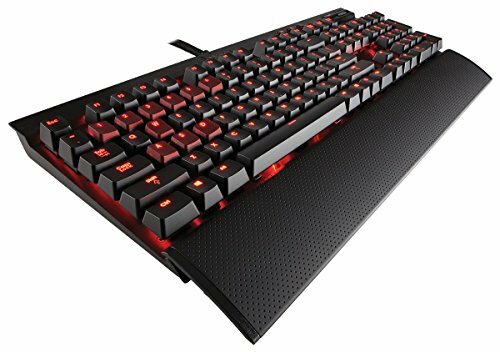 This gaming keyboard features keys that have a lower profile than other gaming keyboards, decreasing the amount of time it takes for your fingers to reach each one while also increasing each key’s response time. The function and macro keys, on the other hand, feature a high elevation that makes it easier to find them during a game. 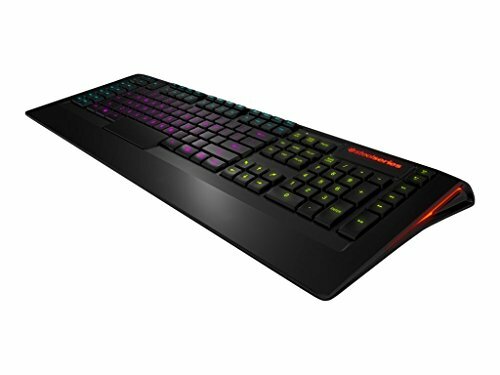 The proprietary SteelSeries Engine software included with the SteelSeries 64470 Apex 350 Gaming Keyboard is an easy-to-use program that lets you program macros, set up different gaming profiles and even adjust the keyboard’s backlight. Razer has a reputation for high-quality gaming keyboards, and the Razer DeathStalker Expert Gaming Keyboard is no exception. With on-the-fly macro recording and a diverse range of fully programmable keys, this gaming keyboard is perfect for both the real-time strategy and MOBA genres. The anti-ghosting capability supports up to 10 simultaneous keystrokes, which can give you an edge in multiplayer online games. With a sturdy case and a braided cable, the Razer DeathStalker Expert Gaming Keyboard is a durable gaming keyboard, making it keyboard the perfect choice for gamers who frequently travel. If you’re looking for something with similar features to the Razer DeathStalker Expert Gaming Keyboard but using mechanical switches, you’ll love the Razer BlackWidow Tournament Edition Essential Mechanical Gaming Keyboard. 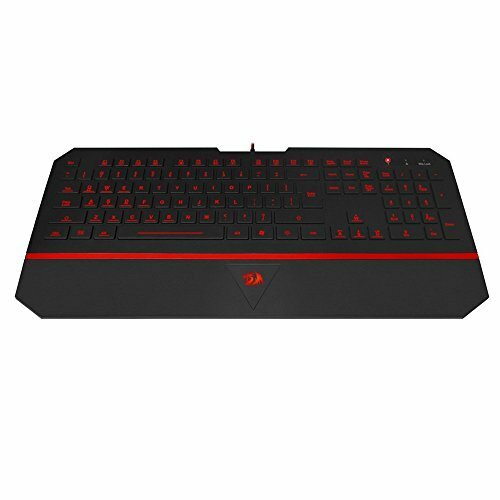 This gaming keyboard includes all of the same features as the DeathStalker, including anti-ghosting capabilities, a durable feel and programmable keys. The mechanical switches under each key improve both the feel and the responsiveness of the keyboard, and you’ll notice an improvement in your gameplay almost immediately. While ROCCAT isn’t a household name when it comes to gaming accessories, the ROCCAT ISKU FX Multicolor Key Illuminated Gaming Keyboard is an excellent mid-range gaming keyboard that gamers will love. 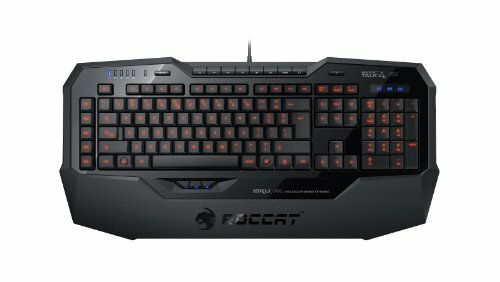 The ROCCAT ISKU FX Multicolor Key Illuminated Gaming Keyboard is full of features designed to give you an edge when you game, including 36 macro keys, three additional keys for your thumb located under the space bar, the ability to store cables underneath the keyboard and a comfortable wrist rest. The G.Skill RIPJAWS KM780 RGB Mechanical Gaming Keyboard is one of the best mechanical gaming keyboards available on the market today, almost solely due to its Cherry MX Red mechanical switches. These switches are some of the best mechanical switches a gamer could ask for, offering a vast improvement in feel and response time over any other mechanical switch. The G.Skill RIPJAWS KM780 RGB Mechanical Gaming Keyboard also features six built-in macro keys, USB 2.0 ports, a media control panel and even a foldable mouse cable holder. This mechanical gaming keyboard is fully compatible with a broad range of operating systems, including Windows 10. The Saitek Mad Catz STRIKE7 Modular RGB Backlit Gaming Keyboard offers a feature not seen in almost any other gaming keyboard: the ability to attach and detach parts. 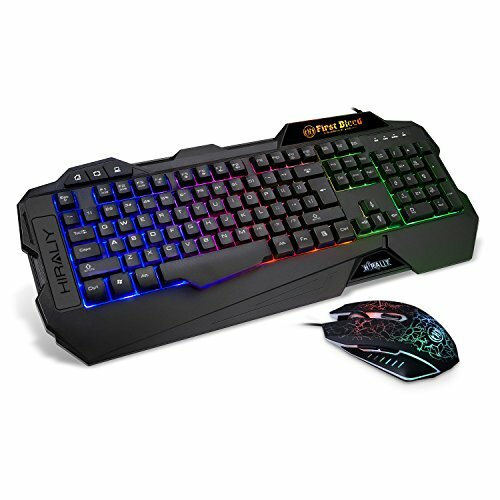 The modular nature of the Saitek Mad Catz STRIKE7 Modular RGB Backlit Gaming Keyboard means that you can customize the keyboard to match what you’re playing; for example, if you’re playing a flight simulator, you can attach a joystick directly to your keyboard. The Saitek Mad Catz STRIKE7 Modular RGB Backlit Gaming Keyboard also places emphasis on your health, featuring three palm rests and two wrist rests. The biggest draw of the Logitech G510s Gaming Keyboard is the LCD screen at the top, which not only displays real-time statistics about the game you’re playing but also VoiP information, such as which teammate is talking. With the 18 programmable keys on the Logitech G510s Gaming Keyboard, you can configure 54 actions per game, letting you pull off advanced combinations before your enemies can even blink. The 3.5mm headphone jack on this keyboard allows you to plug your headset directly into it, making it easy to chat with your friends while you game. No matter which of these 12 gaming keyboards you buy, prepare yourself for a huge upgrade from your current keyboard. In just a few games, you’ll notice the built-in features of your new gaming keyboard giving you an edge during a competition, rocketing you from the bottom of the leaderboards straight to the top. You better prepare for a few all-nighters when you receive your new gaming keyboard, as you’ll want to replay all your old games again! Avid techy, gamer and lover of FPS. I write reviews and comparisons about my favorite keyboards and latest gaming tech. Keyboard Queen Copyright © 2019.